There is just something about a warm soup on a cold day. Truth be told, when it comes to soup, I’m really in it for the “stuff.” Like, the good stuff, the chunks of noodles or chicken or veggies, so traditionally, tomato soup hasn’t exactly been on my go-to list. Then, Mike suggested we do a Roasted Tomato Soup with onions sauteed in beer and lots of delicious spices. Well, as you can tell it peaked my interest enough to try it – and damn, I’m sold! 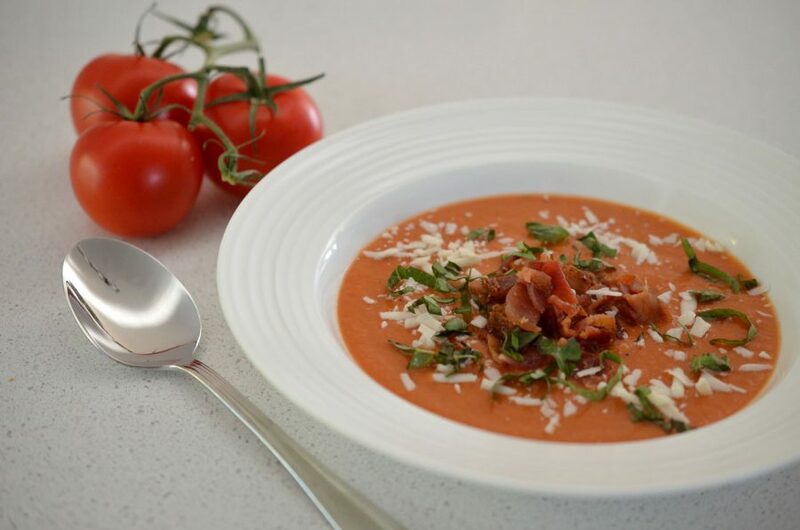 Thick and creamy, this soup has lots of depth and flavour that I didn’t remember tomato soup having. It also doesn’t hurt when you add bacon and cheese at the end too. Delish! In a large food processor or blender, blend the tomatoes until smooth. Place a sieve over a large bowl and pour in the tomato puree to remove any seeds or skin. Discard the sieve, and place the puree from the bowl back into the food processor. The puree should now be smooth. Meanwhile, saute the onions and shallots together with the oil and butter in a large saucepan over medium heat. Stirring frequently, saute for 5-10 mins or until the onions start to soften and become translucent. Add the honey and Chinese 5 spice. Stir to combine. Add the beer and stir until it is almost fully absorbed – about 2 mins. Add the paprika, chipotle powder, oregano, basil and thyme. Stir to combine. Remove the onions from the heat and add to the tomato puree. Blend until smooth. Serve immediately or keep in the fridge until ready to be served. Can be prepare up to two days ahead. Serve with approximately (according to your taste) 2 tbs bacon, 1 tbs of parmesan and 1 tbs basil sprinkled on top.